My colleague Sandy Carter delivered the Enterprise Innovation State of the Union last week at AWS re:Invent. She wrote the guest post below to recap the announcements that she made from the stage. “I want my company to innovate, but I am not convinced we can execute successfully.” Far too many times I have heard this fear expressed by senior executives that I have met at different points in my career. In fact, a recent study published by Price Waterhouse Coopers found that while 93% of executives depend on innovation to drive growth, more than half are challenged to take innovative ideas to market quickly in a scalable way. Many customers are struggling with how to drive enterprise innovation, so I was thrilled to share the stage at AWS re:Invent this past week with several senior executives who have successfully broken this mold to drive amazing enterprise innovation. In particular, I want to thank Parag Karnik from Johnson & Johnson, Bill Rothe from Hess Corporation, Dave Williams from Just Eat, and Olga Lagunova from Pitney Bowes for sharing their stories of innovation, creativity, and solid execution. As I shared at re:Invent, customers such as Infor are already successfully leveraging artificial intelligence tools on AWS to deliver tailored, industry-specific applications to their customers. We want to facilitate more of our Windows developers to get started quickly and easily with AI, leveraging machine learning based tools with popular deep learning frameworks, such as Apache MXNet, TensorFlow, and Caffe2. In order to enable this, I announced at re:Invent that AWS now offers a new Deep Learning AMI for Microsoft Windows. The AMI is tailored to facilitate large scale training of deep-learning models, and enables quick and easy setup of Windows Server-based compute resources for machine learning applications. Forecasts show as many as 31 billion IoT devices by 2020. AWS wants every Windows customer to take advantage of the data available from their devices. Pitney Bowes, for example, now has more than 130,000 IoT devices streaming data to AWS. Using machine learning, Pitney Bowes enriches and analyzes data to enhance their customer experience, improve efficiencies, and create new data products. AWS IoT Analytics can now be leveraged to run analytics on IoT data and get insights that help you make better and more accurate decisions for IoT applications and machine learning use cases. AWS IoT Analytics can automatically enrich IoT device data with contextual metadata such as your SQL Server transactional data. In addition to all of the enhancements we’ve introduced to deliver a first class experience to Windows developers on AWS, we announced that we are including .NET Core 2.0 support in AWS Lambda and AWS CodeBuild, which will be available for broader use early next year. .NET Core 2.0 packs a number of new features such as Razor pages, better compatibility with .NET framework, more than double the number of APIs compared to the previous versions, and much more. With this announcement, you will be able to take advantage of all latest .NET Core features on Lambda and CodeBuild for building modern serverless and DevOps centric solutions. We recently introduced application consistent snapshots with Microsoft Volume Shadow Copy Service (VSS). This enables you to take VSS snapshots with Amazon Elastic Block Store (EBS) for your running Windows instances without the need to create custom scripts or to shut down the instances. This removes the overhead associated with backing up your Windows applications. You can specify a custom number of vCPUs when launching new instances to save on vCPU based licensing costs. For example, SQL Server licensing spend. You can disable Hyper-Threading Technology for workloads that perform well with single-threaded CPUs, like some high-performance computing (HPC) applications. Using these capabilities, customers who bring their own license (BYOL) will be able to optimize their license usage and save on the license costs. As Bill Rothe from Hess Corporation shared at re:Invent, Hess has successfully migrated a wide range of workloads to the cloud, including SQL Server, SharePoint, SAP HANA, and many others. AWS Server Migration Service (SMS) now supports Hyper-V virtual machine (VM) migration, in order to further support enterprise migrations like these. AWS Server Migration Service will enable you to more easily co-ordinate large-scale server migrations from on-premise Hyper-V environments to AWS. AWS Server Migration Service allows you to automate, schedule, and track incremental replications of live server volumes. The replicated volumes are encrypted in transit and saved as a new Amazon Machine Image (AMI), which can be launched as an EC2 instance on AWS. I was pleased to announce that Microsoft and AWS have developed new areas of support integration to help ensure a great customer experience. Microsoft Premier Support is on board to help AWS assist end customers. AWS Support engineers can escalate directly to Microsoft Support on behalf of AWS customers running Microsoft workloads. In November, we updated our HIPAA-focused white paper, outlining how you can use AWS to create HIPAA-compliant applications. In the first quarter of next year, we will publish a HIPAA Implementation Guide that expands on our HIPAA Quick Start to enable you to follow strict security, compliance, and risk management controls for common healthcare use cases. I was also pleased to award a Digital Innovation Workshop to one of our customers in my re:Invent session, and look forward to seeing more customers take advantage of this workshop. A common thread we see across customers is that continuous innovation from AWS enables their ongoing reinvention. Continuous innovation means that you are always getting a newer, better offering every single day. Sometimes it is in the form of brand new services and capabilities, and sometimes it is happening invisibly, under the covers where your environment just keeps getting better. I invite you to learn more about how you can accelerate your innovation journey with recently launched AWS services and AWS best practices. 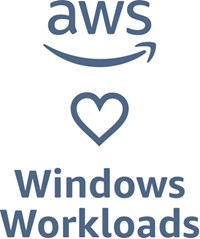 If you are migrating Windows workloads, speak with your AWS sales representative or an AWS Microsoft Workloads Competency Partner to learn how you can leverage our re:Think for Windows program for credits to start your migration.